22 years ago Graham Barrett and I founded the Australasian Society of Cataract and Refractive Surgeons (AUSCRS). 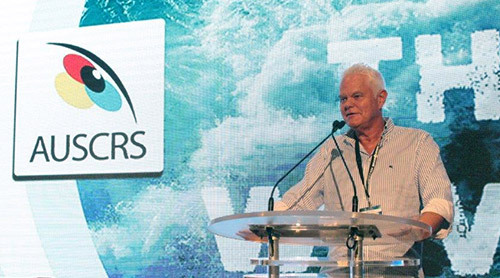 We formed AUSCRS to provide ophthalmologists with the first organised forum of its kind in Australia. At the time there was a lack of adequate forums for ophthalmologists specifically interested in cataract and refractive surgery. Today, AUSCRS is the peak body for cataract and refractive surgery education. It is a world class meeting and interested ophthalmologists can stay up-to-date with the latest technology and techniques. Graham and I are most pleased with our teaching efforts over the years. 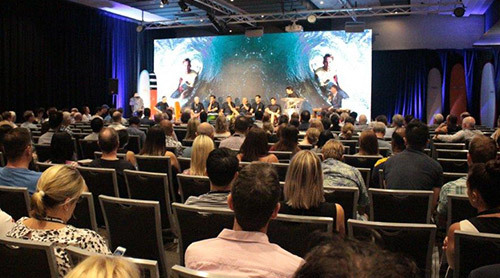 At this year’s AUSCRS conference, held in Noosa on 17-20 October 2018 and attended by over 300 surgeons and support staff, the theme was “Ride the Wave”. This year’s Gold Medal Lecture recipient was Prof Thomas Kohnen. Prof Kohnen is professor and chairman of the Department of Ophthalmology, Geothe University, Frankfurt, one of the busiest teaching hospitals in Germany. He leads a team that helps more than 35,000 patients annually and is highly active in teaching and research. He is also editor of the Journal of Cataract and Refractive Surgery. 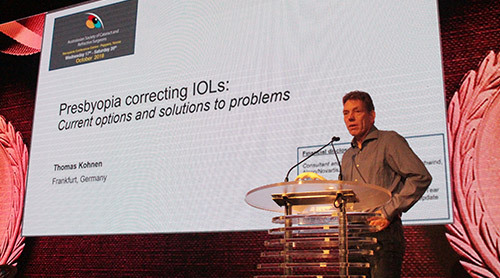 Prof Kohnen’s lecture was on the topic of “Presbyopia Correcting IOLs: Current Options and Solutions to Problems” and raised some very important discussions. I had the pleasure of presenting my findings on several topics and being involved in a number of discussions. My main presentation was titled “A New IOL Material and Injection System: Clareon and AutonoMe” and described the new intraocular lens material and injection system, which is driven by pressure from a tiny carbon dioxide cylinder within the assembly. Particularly interesting was the presentation by Dr Rolando Toyos from the USA on the topic of “Intense Pulse Light (IPL) Treatment for Dry Eye Disease”. There is now much research to support the effectiveness of IPL in treating dry eye – a treatment regularly used at my clinics for laser patients with dry eye, in order to optimise eye lubrication prior to laser eye surgery. The topic of SMILE was also raised and the presentation titled “Analysis of 4 years of SMILE Laser Vision Correction – Learning Curve, Visual Result and Enhancement Rates” by Dr Anil Arora, demonstrated some interesting data of outcomes for patients. His results were good. However, I believe that further improvements to this procedure are needed. I think the only SMILE laser machine available at this stage cuts the cornea too roughly, probably because of the long wavelength of the Zeiss laser. Currently two new manufacturers are completing development on the next generation of SMILE (or whatever name will be given to the procedure). This will be something to watch. Currently SMILE is not as predictable as our LASIK and I believe this may change as better technology becomes available. Overall, this year we shared a wealth of information, with over 70 doctors’ sessions presented by international and local experts. Thank you to all my colleagues and peers for their valuable contributions to these important discussions in the ever-evolving world of cataract and refractive surgery. Gold Medal Lecture recipient, Prof Thomas Kohnen, professor and chairman of the Department of Ophthalmology, Geothe University, Frankfurt. This entry was posted	on Monday, October 29th, 2018 at 1:27 pm	and is filed under In the News. You can follow any responses to this entry through the RSS 2.0 feed. Both comments and pings are currently closed.